Rwandan refugees in Zambia have continued living in fear of being betrayed and sent back to Rwanda where they will face imprisonment or death. The fear by the refugees some of them who came into Zambia in 1994 has been heightened by the so called ‘cessation clause’ that the Zambian government is following. The cessation clause in effect means that after a given deadline, all Rwandan refugees in Zambia will lose their refugee status and those who will be found in Zambia will be treated as illegal immigrants and subjected to arrests and deportations. The cessation clause to which has the blessing of United Nations High Commission (UNHCR) is based on information that circumstances in the country of origin, Rwanda have changed and that it is now safe for refugees to return. that those who have stayed in Zambia for a long time should be given the opportunity to decide to be integrated into the local community, – or to look for another country that is willing to settle them. 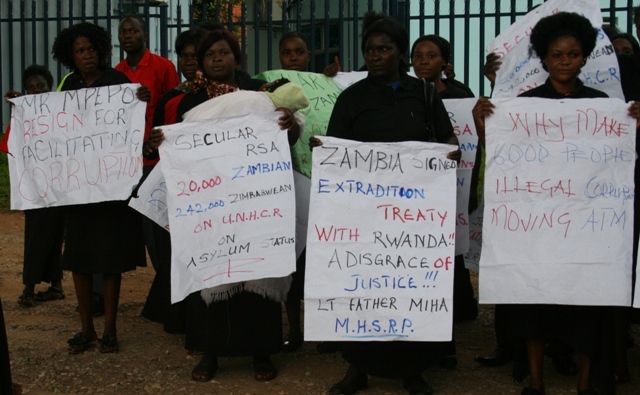 To demonstrate their fear and unwillingness to be sent back to Rwanda, the refugees held a protest march on January 13. One of the refugees explained to the Watchdog that the Zambia Government acted in bad faith by signing the tripartite agreement with Rwanda counterpart and UNHCR. The refugees explained that the Rwanda government coerced Zambia to sign the agreement. They further said that the Zambian immigration has now started harassing them. Ntamabyario was abducted by “unknown people” on 27th May 1997 and she is currently in a Rwandan jail.